You never get a second chance at a first impression. 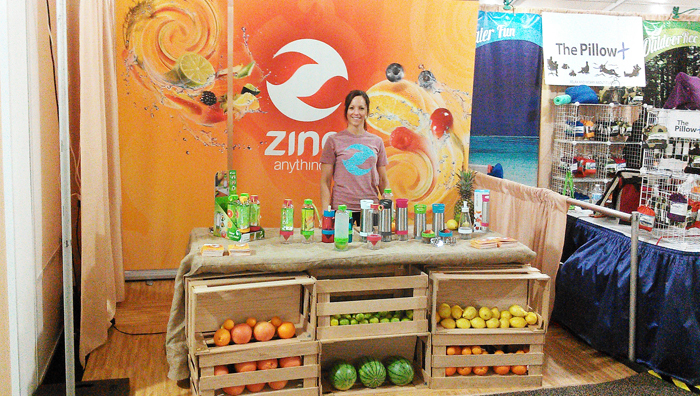 Excellent trade show graphics can help ensure that your brand makes an impact. At trade shows, exibitions, and networking events, brands gather with the goal of making a favorable impression on visitors, hoping to win customers or woo new talent. There is a lot of work that goes into designing, printing, and setting up incredible trade show graphics that will attract visitors. But done well, the returns for your brand can be immeasurable. 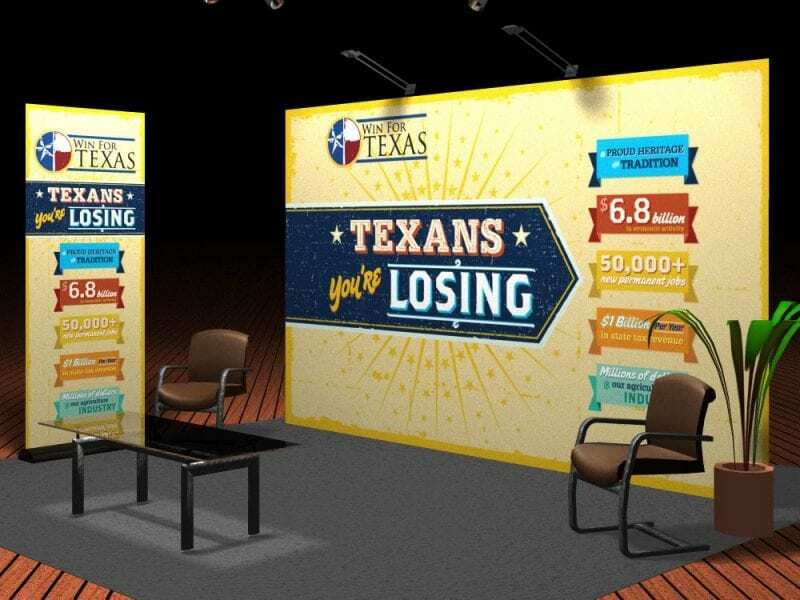 We walk you through the basics of designing incredible trade show graphics to help your booth become the talk of the exhibition. What are trade show graphics? Why are they important? And why should you consider them an investment? Here are the foundations of why quality trade show graphics are an integral part of your exhibition strategy. What are trade show graphics? 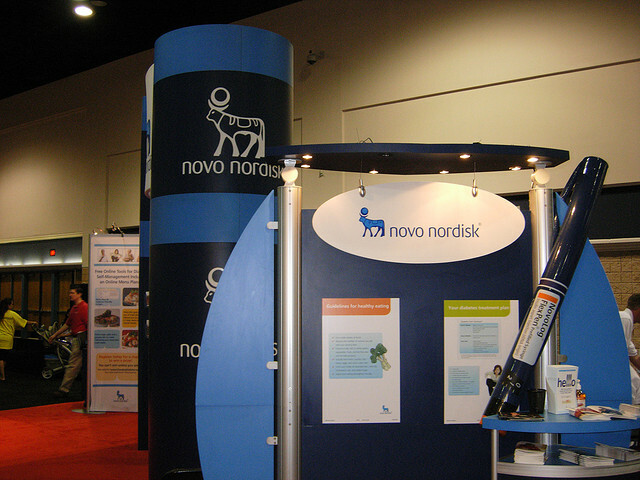 Trade show graphics are the printed visual assets that a brand displays at their exhibition booth. Trade show graphics refer generally to two-dimensional assets, though they can be displayed in dynamic, three-dimensional formats. In most cases, trade show graphics integrate text and images to convey branding messages. 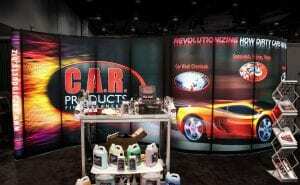 The category of trade show graphics includes banners, backdrops, signage, placards, floor graphics, and pop-up and table top displays, among others. 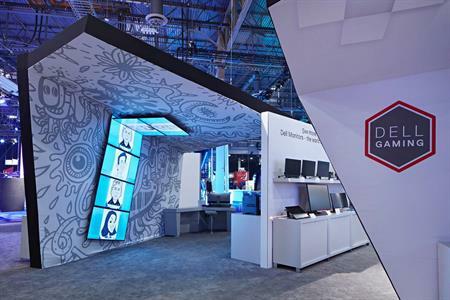 Why are trade show graphics important? The Center for Exhibition Industry Research reports that trade show attendees generally devote just three seconds to determining whether or not they will visit a booth. That means you have a three-second window to convince someone that your brand is worth their time. Does this sound like a lot of pressure? It is, but there is also a flipside. Humans rely heavily on visuals to make judgements, which is great news if you think about how hard it would be to convince anyone of anything with a three-second verbal argument. 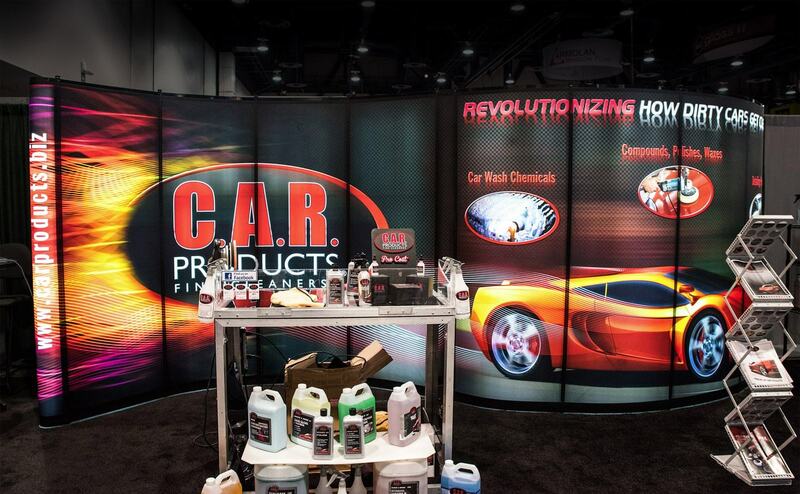 When you use attractive trade show graphics, you don’t need to approach people to make an initial brand impression. You can let your graphics do some of that intial talking for you. How much time and money should I budget for trade show graphics? While there is no singular answer for this question, you should absolutely think of trade show graphics as an investment. 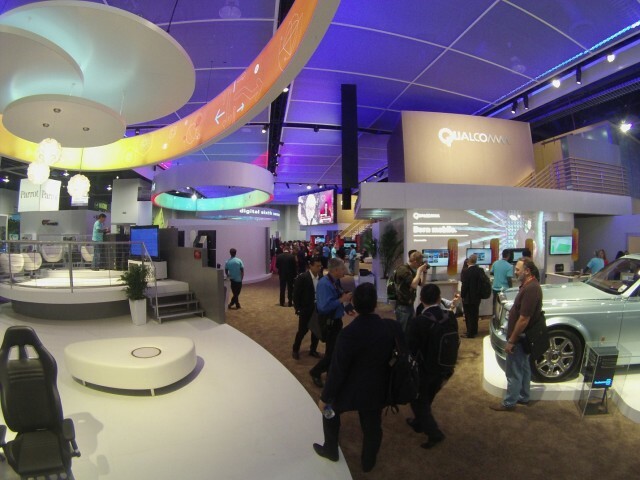 The quality and effectiveness of trade show graphics are a direct reflection on your brand. Like so many other marketing efforts, your customers will notice if your trade show graphics are hurried, sloppy, cheap, or unoriginal, and you may end up doing more damage than creating savings. When it comes to trade show graphics, there is nothing to be gained in the long-run by cutting corners in the short-run. We always advise clients to invest the time and money into doing trade show graphics right the first time so that they can be successfully reused for years to come. 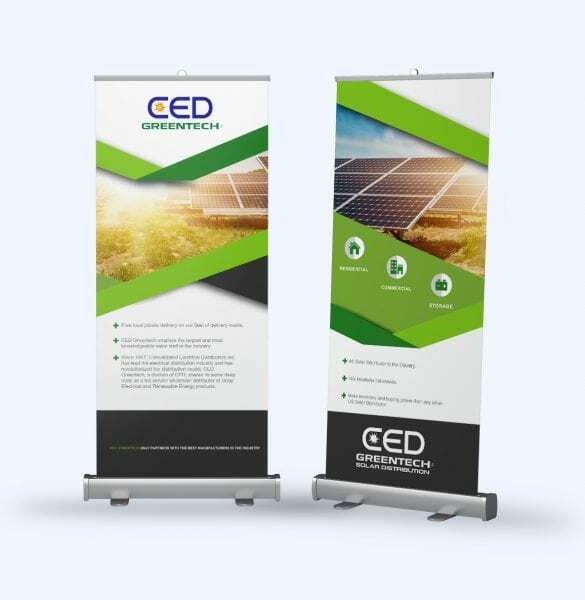 Retractable banner stands can be used time and time again, making them a great investment. That said, trade show graphics don’t have to be huge, complicated, or expensive. What kind of graphics you should used depends on a ton of factors. In a later section, we’ll discuss how to evaluate your goals along side the conditions of the event in order to creat trade show graphics that meet your needs. What are trade show graphics supposed to accomplish and how? Determining what success means for your brand is an important aspect of designing trade show graphics. Here is how to figure that out, and how to meet your trade show goals. For most any company or business that takes part in a trade show, brand exposure is a top-ranking goal. Trade show graphics are a crucial piece of the puzzle when it comes to creating a positive and memorable experience of your brand for attendees. Is your brand more traditional or edgy? More reserved or outspoken? More serious or playful? The same brand may use different strategies depending on the event. Here, Dell’s trade show graphics are professional and safe. But at a gaming conference, Dell opts for an edgier, more modern look for all their trade show graphics. Is your brand meant to appeal to a certain gender? A particular age group? People with particular lifestyles? Bright, energetic, fresh and feminine: these trade show graphics channel the traits of its target demographic. Sleek, intense, serious, masculine: these trade show images speak to a completely different type of clientele. How recognizable is your brand name at this event? Are you trying to expose your brand to as many new people as possible, or are you introducing a new product? 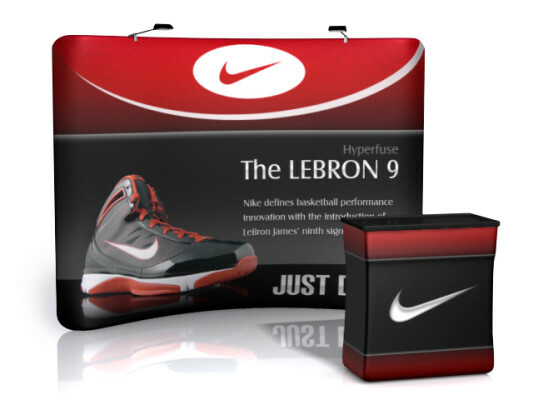 Well known names like Nike and Lebron James can lean heavily on brand recognition in designing their trade show graphics. The graphics you choose will inevitably depend heavily on who you are trying to reach and how you are trying to reach them. But no matter what, you can generally guage the effectiveness of your graphics by how receptive visitors are to your intended message once they’ve approached your booth. If they are open to what you are promoting, then your trade show graphics have have done a good job priming visitors. 1. Long-range graphics are meant to be seen and understood from far distances. Ideally, these graphics will be visible and legible to attendees who are at the furthest point away from your booth in the exhibition hall. When it comes to long-range graphics, the higher the placement, the better. 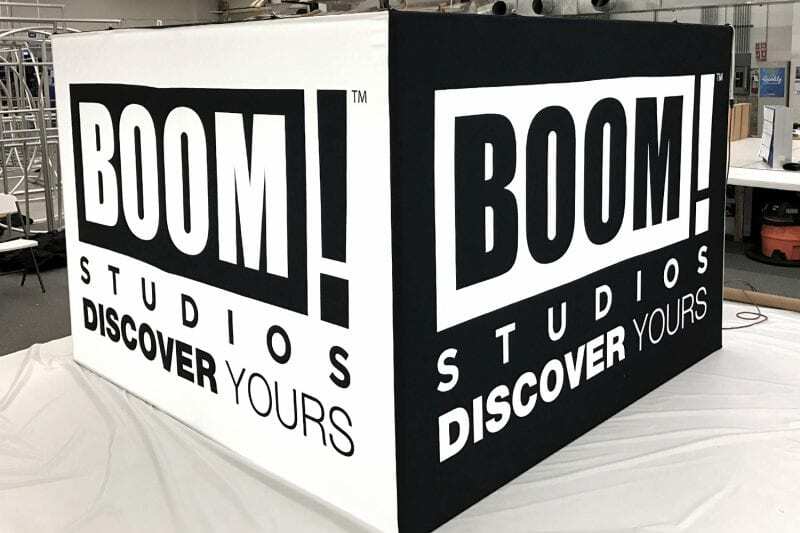 Placing these graphics so that they are visible from areas of the event that are high traffic (think the entrance, lounge, or dining area) will ensure that no one misses your booth in the bustle. With contrasting colors and concise messaging, this high-flying trade show graphic is sure to get some attention. The goal of long-range trade show graphics is above all recognition. They need to be legible from a distance, which means they should be simple. Intricate images and and lots of texts are big no-nos if you want people to be able to read your banner from across the exhibition hall. We recommend sticking to a stripped-down and high-contrast version of your brand’s color pallet, a highly legible font, and either the most eye-catching or the most recognizable image/slogan of your brand. If your logo is one that a lot of trade show attendees are already familiar with, you’d do well to put it on your long-range graphics. If your brand is still relatively unknown, then it may be best to feature a particularly catchy slogan instead. Of course, not every event or venue is right for long-range graphics. 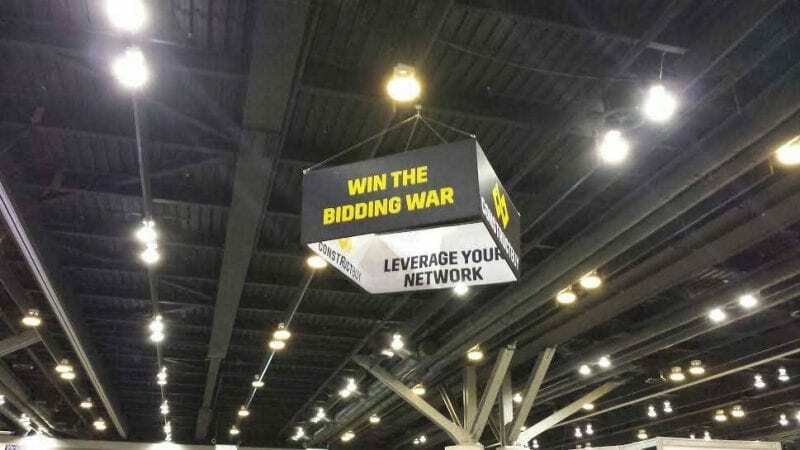 Depending on the occasion and your industry, it could be considered too loud to erect a high-flying banner above all the other booths. Use your best judgement to assess whether a long-range graphic is appropriate for the event. If it isn’t, then make sure to work some of the goal-oriented elements discussed here into your mid-range graphics. 2. Mid-range graphics are meant to be seen from neighboring booths. You can think of these kinds of graphics as a means of luring attendees away from competitors. This is where you can introduce elements of your sales pitch, enticing features like games and freebies, and images that speak to the lifestyle and interests of your target demographic. If you can create mid-range trade show graphics that catch the eyes of customers while they are visiting another booth, you’ll know you’ve done a great job. A provocative statement like this one is perfect for mid-range graphics. It encourages visitors to approach the booth and learn more! While mid-range graphics do need to be legible from several yards away, they don’t need to be as stripped-down as long-range graphics. Because the goal of mid-range graphics is to conjure curiousity, these graphics should convey enough information to make anyone who sees it want to learn more. Questions make great content for mid-range graphics since they beg to be answered! 3. Short-range graphics are those that are only legible to the people who have already stopped into your booth. This is where you can capitalize on the interest they have already expressed and focus on conversion. 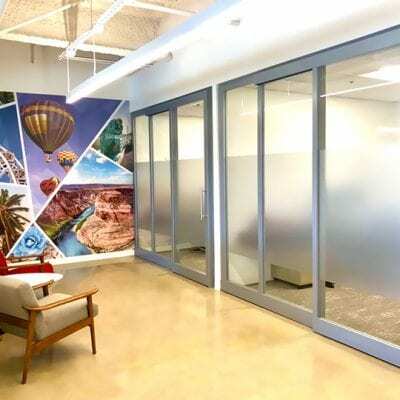 Whether your goal is to win over a new customer or a new hire, short-range graphics are the place for the details that truly seal the deal. Think unique product features, competitive employee benefits, and stories of your brand’s successes. These rollup banner stands are a great place to include more in-depth product specs. Short-range graphics are a great place to print off long-form text, more intricate graphics, and practical details like contact information. While they don’t need to be legible from a distance, you should still be considerate of vistors’ time and attention spans. You don’t want to create a traffic jam at your booth because a graphic takes too long to read, and you also don’t want people losing interest. Short-range graphics should concisely tell a conclusive story. Anything longer is meant for pamphlets that visitors can take home with them. Equally important as the information on your graphics is how that information is composed. When placement, color, text, and images don’t come together to form a cohesive whole, trade show graphics end up looking sloppy. Sloppy is an adjective that nobody wants associated with their brand. 1. Contrast – Do the colors and design elements differentiate from one another in a way that is pleasing to the eye? Are the most important elements of the design visually distinguished from the less important elements? Contrast doesn’t necessarily need to mean lots of color. Black and white can be just as eye-catching! 2. Flow – Westerners digest texts and images from left to right, top to bottom. Is your graphic laid out in a way that is logical and will facilitate your message? Is it clear to the viewer where they should begin when they look at your graphic? Is it clear when they’ve reached the end? 3. Focus – Where do viewers’ eyes naturally gravitate towards in the design? Do other design features complement and harmonize with this element? If you have two elements competing for that first glance, consider which one is more important to your message and tone the other one down. You don’t want it diluting the power of the focal point. 4. 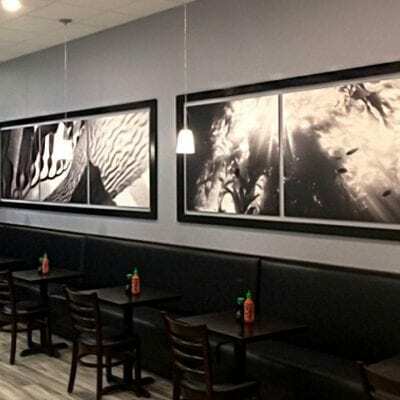 Imagery – Are the images you use in your graphics clear and relevant enough, that a viewer could understand the connection without reading your copy? Do your images reinforce or complement the copy on your graphics? Are you economizing on the fact that images can often convey complex, sensory, or abstract concepts far more quickly than text? 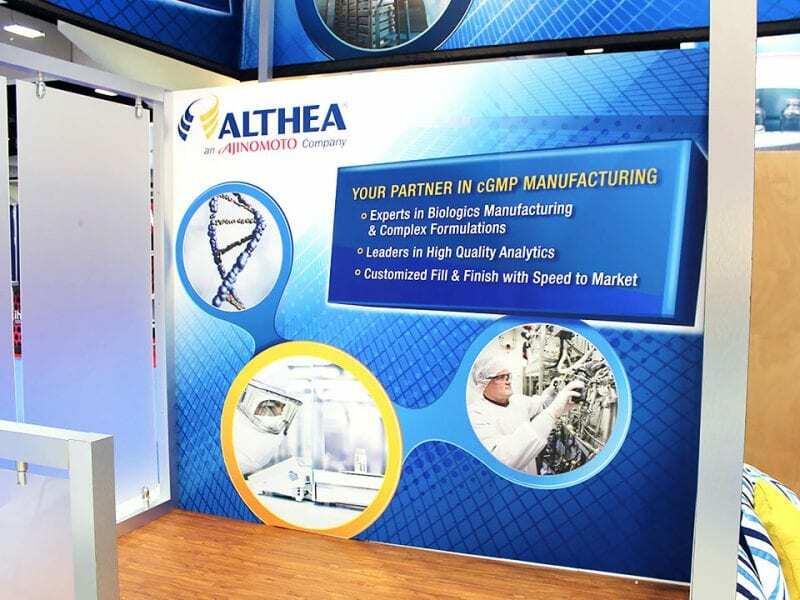 The images on this backdrop convey that this company is in the biological manufacturing field faster than the text does. So now you know the basics of how to design effective trade show graphics that will attract people to your booth. But while attracting people to your booth with top-notch graphics and displays is one of the most important parts in making your trade show a success, it’s only part of the battle. Maximizing the effect of your graphics also demands a stellar inbound marketing strategy to help you convert the leads you generated with consistent follow up. Below is a great example of a post-event workflow that you can implement with using event lead management software. To get a return on your investment in a trade show, it’s crucial to engage your leads quickly and efficiently. 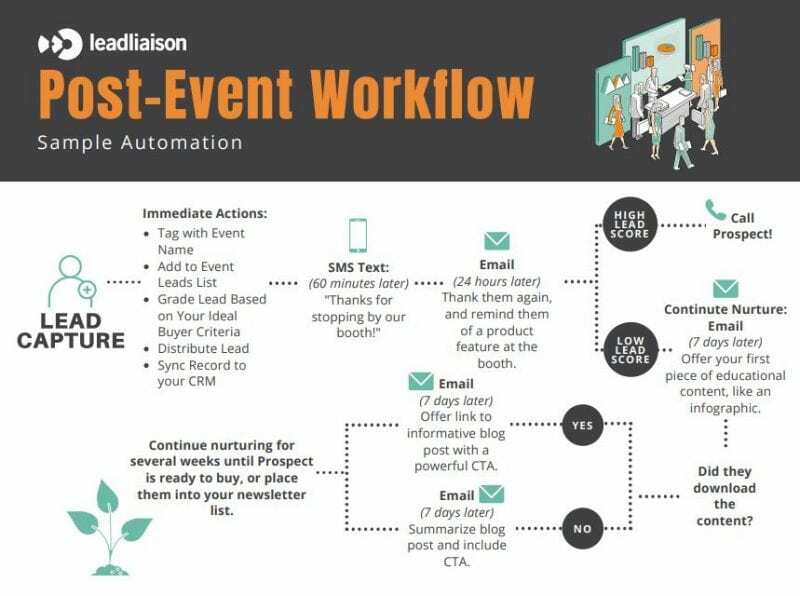 Event lead management provider Lead Liaison proposes following up with trade show leads according to this workflow. It can be difficult to get an exact gauge on how aesthetic elements like graphics and booth design impacted your sales. For this reason, establishing a standard inbound strategy and post-event follow up work flow can go a long way in measuring your returns. Comparing results from past events with new ones can help you narrow down which factors, such as trade show graphics, contributed to or detracted from your success at the event. Not only is your follow-up workflow essential for measuring success, it’s also a way to boost your conversions overall. Many people who don’t consider themselves to be artistically inclined may be intimidated by the prospect of creating effective trade show graphics. The good news is that having expert knowledge of your brand, messaging, and intended audience can bring you very far in the design process. Need more than just some tips on trade show graphic design, and need help planning the whole event? This ultimate list of 60+ event marketer resources will cover everything from planning, to promotion, to budgeting and beyond! 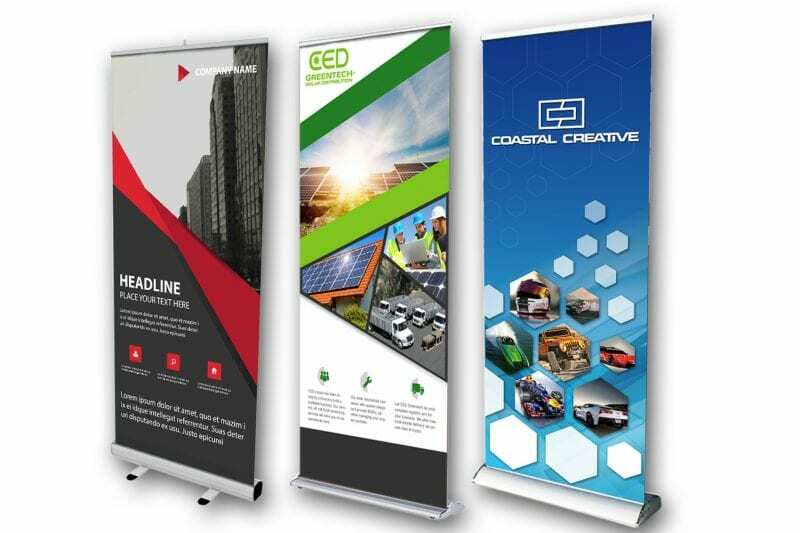 When your expert brand knowledge combines forces with the design and printing team Coastal Creative, stunning trade show graphics are born. Contact us today for a free consultation on designing and printing the perfect trade show graphics for your needs.